Joseph W. Svec III, a Dioramist, is a retired Senior Staff Satellite Test Engineer and college instructor, as well as a published poet and author. He has written and presented numerous technical papers at the International Aerospace Testing Seminar and to the Institute for Social Innovation. He has written and had published one book of rhymed story poems, Mystical Journeys, with a second in work. He has also published several magazine articles on toy castles and knights, in addition to "A Guide Book to Toy Castles and Knights" from Around the World. His Toy Castle book currently has satisfied readers in 35 states and 16 different countries. Joseph enjoys travel, reading, writing poetry, creating miniature historical dioramas, playing acoustic guitar, and enjoying afternoon tea. His tea cabinet currently includes over 127 different flavors and varieties of tea. Joseph has led campfire programs in the El Dorado National Forest and Sea Shanty Workshops for the Northwest Seaport Museum in Seattle. He currently lives in the shadow of a castle here in Ione with his childhood sweetheart, and he is the master gardener for Ione Rose Garden Cottage vacation rental. In addition to the above, Joseph points out that he really does enjoy creating miniature dioramas. As well as numerous medieval castle dioramas, he has made scenes based on many other historical eras and even dioramas based on the classical music pieces A Night in Bald Mountain and In the Hall of the Mountain King . He currently has a large futuristic (based on the future as imagined in the 1950's) Moonbase Monorail diorama set up at home. This diorama displayed in Hein & Company Bookstore is particularly interesting, as September 21st is the 148th anniversary of the birth of H.G. Wells. 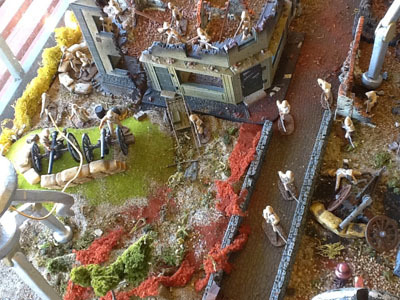 The diorama represents scenes from H.G. Wells' The War of the Worlds, which was the first novel to depict an invasion of Earth by Extraterrestrials. Written in 1889, it showed Earth's forces being overrun by the superior technology of the Martians. It is quite amazing to imagine such a tale written back then. 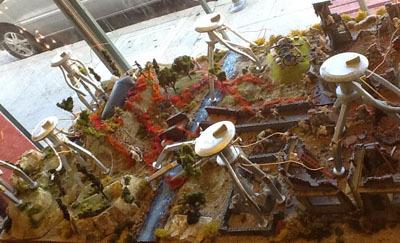 While displayed as one large diorama, it actually contains two sections: The first being the opening of the Martians cylinder that had landed; and next, the initial contact between the Humans and the Martians. 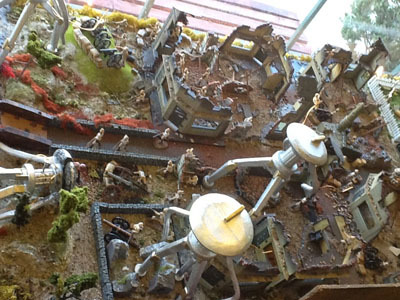 The largest section depicts the Martian tripods as they advance through the town destroying the countryside. The story has inspired numerous movies, radio dramas, and sequels, several of which Joseph will be talking about at the September 2nd meeting of the Holmes' Hounds. The Holmes' Hounds, if you don't already know, is the Amador County Sherlockian Society interested in all things pertaining to Sherlock Holmes and other characters of his era. While Joseph's presentation focuses in particular on another literary character created by Sir Arthur Conan Doyle, the fascinating Professor George Edward Challenger, made famous in the novel The Lost World, there are several War of the Worlds sequels that feature both Sherlock Holmes and Professor Challenger, and he will be discussing those in greater detail. In addition to the Hein & Company War of the Worlds diorama, Joseph currently has a Robin Hood Castle diorama in the window of the Volcano Theater Company's Cobblestone Theater to promote their current stage production of Robin Hood, which we have heard is outstanding! Joseph has enjoyed creating miniature dioramas since he was a child, and now he is pleased to share his interest with others so they can enjoy being whisked away into a miniature world of adventure! International Orders: Please email us for shipping costs.